Martial Law? What Martial Law? 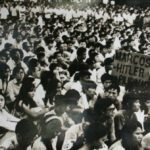 What Marcos dictatorship? Never happened! Go home. To address this problem, we’ve put together this short summary using highly reliable sources such as Wikipedia, elementary school textbooks, FB sites and random kids walking around our neighborhood. Martial Law was declared in 1972 by a saintly Dalai Lama-type, all-around good guy president named Ferdinand “Gorgeous” Marcos. He was not a liar. He was not a thief. He was not a murderer. He was not a fake war hero. He was so not corrupt. He was not married to a demento klepto. We have this on the best authorities, namely his relatives. He was actually forced to declare Martial Law because of threats to the nation’s freedom and liberty. To protect these, he took them and put them in a very safe place — a vault inside Malacañang Palace. He could have put them in any of his bank vaults in Switzerland but they were all full of money he had so not stolen. Oh, and another reason he was forced to proclaim Martial Law? His defense minister Juan Ponce Enrile was ambushed / not ambushed / ambushed by mysterious terrorists / henchmen / gunmen. Martial Law means “military rule” but it was a FRIENDLY rule. Marcos, his wife, and their cronies were smiling, even though they were straining to heave and carry off all that loot and cash. Armed soldiers went out to the streets to raid newspapers, TV stations, etc – but the soldiers were SMILING. Here’s the thing: ordinary citizens, youths, students, peasant leaders, bystanders were unnecessarily panicked and started running blindly for cover, mysteriously ending up in military stockades and intelligence safe houses. Goodness! Marcos never even knew those safe houses existed! Anyway, the military goons in these places were taken by surprise and instinctively started torturing, beating up and killing all these people. And this kept happening year after year. Yes, we know, amazing, right? All this was accidental, the deaths were clearly caused by the victims themselves. We have all this on good authority, namely Marcos’ best torturers. Wait, did we say “torturers”? We meant honorable military and police officers. It was so not true that there was total censorship of the press during Martial Law. Filipinos had a wide array of media to choose from: (1) The Marcos controlled press; (2) The Marcos intimidated press;(3) All of the above. See? Plenty! And people who complained or protested were always given space to do so – usually in a jail cell with an actual bed! How about that! But it all started unraveling when in 1983, a troublemaker named Benigno Aquino somehow arranged to kill himself and pin the blame on Gorgeous Marcos. Wouldn’t you know it, you had riots and trouble, and in 1986, Marcos found himself cheated in a totally credible election (we have this on good authority, namely the election officials at that time). Next thing you know, he was fleeing with his family, with only enough time to pack several cargo planes full of loot and gold and stuff. And he died of heartbreak abroad. Or maybe he ruptured something, carrying all that loot. Talk about ingratitude of the people. That’s the story of Martial Law, which holds two lessons Filipinos should never forget: first, always respect the dead Marcos, because he has rich and powerful living relatives. Second, remember: crime does not pay. It earns interest in Swtizerland.